Learn how to connect the ESP8266 chipset to Ubidots Application Development Platform over HTTP. By following this guide you will be able to PUBLISH and SUBSCRIBE data to/from Ubidots using the ESP8266 as stand alone module in just a couple of minutes! An Arduino UNO , UARTbee or any UART to USB device. Arduino IDE. Version 1.6.6 or higher. 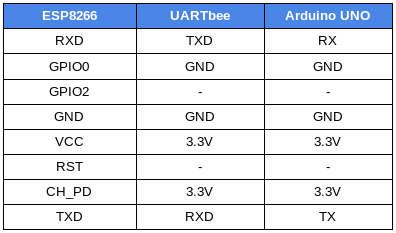 To be able to program the ESP8266 as stand alone module you will need any UART to USB device such as the UARTbee, or you can program the module through any Arduino board by setting the Arduino RST to GND. 1. To begin, establish the connection between the device used to program the ESP8266 by following the table below. 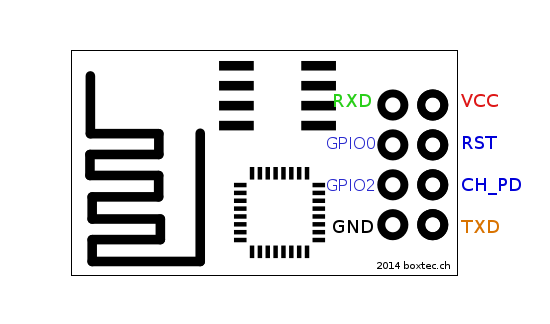 First, let's identify the pin out of the ESP8266 to avoid any future hardware issue. IMPORTANT NOTE: If you are using an Arduino UNO to access the ESP8266 you will need to set Arduino RST to GND. Please be careful with the VCC of the ESP8266, it works only with a 3.3V supply. 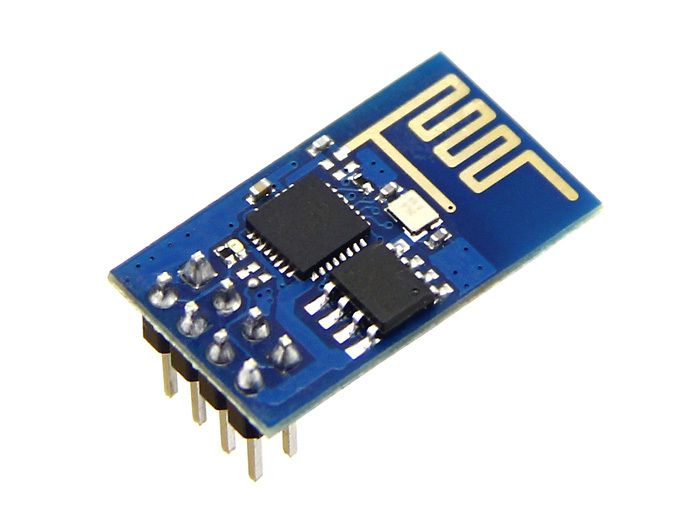 confirm that the board: Generic ESP8266 Module is selected in the Arduino IDE. For additional assistance selecting the board, see step 2 in the Setting up the Arduino IDE below. 1. To be able to work with the ESP8266 platform in the Arduino IDE, you will need to install the ESP8266 board using the preconfigured Arduino Board Manager. If you are not familiar with adding a board with the Arduino IDE, refer to this article for additional guidance. 2. With the ESP8266 platform installed, select the ESP8266 device you are working with. In the case, we are working with a “Generic ESP8266 Module”. To select your board from the Arduino IDE, select Tools > Board “Generic ESP8266 Module”. 3. Download and install the UbidotsMQTTESP8266. For a detailed explanation of how to install libraries using the Arduino IDE, refer to this guide. With the following sample code you will be able to post the readings taken from GPIO pins of the ESP8266. 1. To publish your first value in Ubidots, open the Arduino IDE and paste the sample code below. Once you have pasted the code, you will need to assign your unique Ubidots TOKEN, SSID (WiFi Name) and Password of the available network. 2. Verify your code within the Arduino IDE. To do this, in the top left corner of our Arduino IDE you will see the "Check Mark" icon; press it to verify your code. 3. Upload the code into your “Generic ESP8266 Module”. To do this, choose the "right-arrow" icon beside the "check mark" icon. 4. To verify the connectivity of the device and the data sent, open the serial monitor by selecting the "magnifying glass" icon in the top right corner of the Arduino IDE to see the connectivity logs. NOTE: If no response is seen, try unplugging the UART to USB device and then plugging it again. Make sure the baud rate of the Serial monitor is set to the same one specified in your code 115200. 5. Confirm your data in Ubidots. Now you should see the posted data in your Ubidots account, located the device called "my-new-device". With the following sample code you will be able to subscribe a value from Ubidots to start controlling any asset you desire. SSID (WiFi Name) & Password of the available network connection. Device Label of the device which contains the variable to want to GET. 2. Verify & Upload the code into the board following the same steps provided in the PUBLISH step above. 3. To verify the connectivity of the device and the data which is being received, open the serial monitor by selecting the "magnifying glass" icon in the top right corner of the Arduino IDE to see the connectivity logs. 4. In the serial monitor, you will be able to see the last value received in Ubidots of the variable specified in the firmware. With this simple tutorial you are able to PUBLISH & SUBSCRIBE data to/from Ubidots with the ease of the Arduino IDE and an ESP8266 as stand alone module. If your wish to find more examples to handle context or timestamp values in your request checkout Ubidots documentation with the ESP8266 by clicking here.